Portions of Vail’s Back Bowls will be open by this weekend, according to Vail officials, but snow riders may have to share them a mountain lion that’s been spotted recently on Vail Mountain. 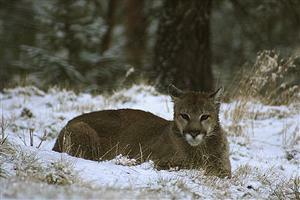 A mountain lion in Colorado (Colorado Parks and Wildlife file photo). As of Wednesday afternoon, Vail was listing 1,422 of 5,289 of skiable acres open to the public. Additional terrain would come at a good time as snow riders descend on Vail for this week’s annual Snow Daze season kick-off celebration and just two weeks remain before the busy holiday period. Vail Ski Patrol on Tuesday also reported it has recently received calls about a mountain lion sighting on the front side of Vail Mountain. No confrontations with the animal were reported. Snow riders who see a mountain lion on Vail Mountain should stay away from the animal and contact Vail Ski Patrol at (970) 754-1111 or Vail Mountain Security at (970) 754-3049. In the event of a mountain lion confrontation, experts advise facing the animal, trying to appear as large as possible and making noise. People should not attempt to feed any wildlife on Vail Mountain. For more information about Vail Mountain visit www.vail.com, or stop by the Mountain Information Center or call (970) SKI-VAIL (754-8245).